Jaisalmer is one of the popular cities of Rajasthan which is known for its massive Golden Fort. The city is very closely nestled to Thar Desert. The city is also known for its forts and palaces and other many tourists attractions which are worth visiting. The tourists visit this city all through the year and explore the gorgeous sightseeing of Jaisalmer. The city has many places where the tourists can enjoy the super luxurious accommodations in the various heritage hotels and plus 5 star resorts. But there are all kinds of tourists who visit here and they look for worthy accommodations and budgeted hotels so that they can enjoy the city even in their limited budget. This is one of the most economical hotels of Jaisalmer where the guests can enjoy clean rooms and good services. The hotel is having all kinds of comfortable facilities which can make your stay a luxurious one. The hotel is also having an open roof top restaurant where the guests can have their meal while watching the Golden Fort and the hotel is very much close to Jaisalmer Station too. This hotel is also amongst the best budgeted hotels in Jaisalmer where the guests can have a nice and comfortable stay and the guests can enjoy open rooftop restaurant, laundry services, limited room services, tour facilities and internet and WI FI facilities. The tourists can also avail the bus and ticket bookings from here. This hotel is having the best facilities and accommodation for the guests who visit Jaisalmer. The price is very economical and the tourists who visit here can enjoy well furnished and amenities equipped room, the guests can also enjoy swimming pool, rooftop restaurant, facilities of camel and jeep safaris and the guest can also explore the various other sightseeing arranged by this hotel ‘s management. This is one of the best hotels in Jaisalmer where the guests can enjoy the best facilities of comfortable yet lavish stay at the city and the tourists who stay here can also enjoy the facilities of free internet facility, superb accommodation with all kinds of comfortable equipment installed, room services, bus and train ticketing facilities and many more. This is one of the best economical hotels which is known for its excellent services and also awarded for that. The hotel can provide you with the best of the services are neat and comfortable rooms with air condition and Wi- Fi facilities, along with the 24 hour room service, cable, telephone, laundry services. 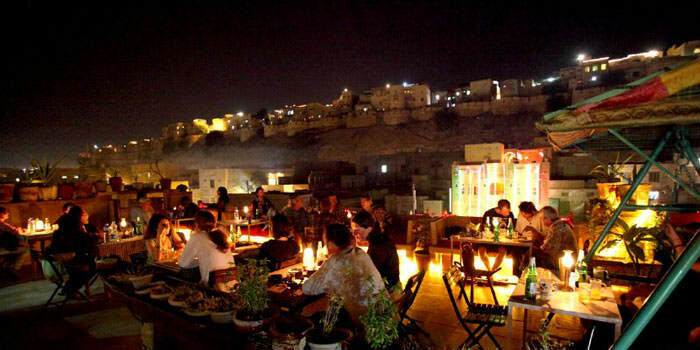 The hotel is also having a rooftop restaurant for the best meal in Jaisalmer. This hotel is not so big but there are 10 beautiful rooms are there which are equipped with all kinds of comfort and amenities and you can enjoy the rooftop dining in its rooftop restaurant and the hotel is having a very close proximity from the railway station. The hotel can also organize for safaris for the guests. The hotel is having all kinds of room facilities for the guest and they can choose from the AC and Non AC rooms and all of the rooms are well maintained and they are equipped with television, comfortable and large beds and s not over decorated to keep it simple yet classy. This hotel is also one of the budget hotels in Jaisalmer and this hotel used to be a haveli before but has been converted in to a hotel. The hotel is the sister hotel of Shahi Place and the room are well decorated and maintained and the hotel is also recommended by many travel sites because of its excellent services.